Admiral Penn is now close to death and cannot bear the thought of dying with his son in prison and a social pariah. So against his son’s wishes, he pays the fine to purchase his son’s release. The father had come to respect his son’s integrity and courage and had admonished him to let nothing tempt him to wrong his conscience. The Admiral knows that after his death, young Penn will become more vulnerable in his pursuit of justice for Quakers. Accordingly, he writes to the Duke of York (later he becomes King James II), the successor to the throne, and cuts a deal with the Crown. The Duke and King agree that in honor of the Admiral’s lifetime of service to the Crown, they promise to protect young Penn and make him a royal counselor. Upon the Admiral’s death, young Penn acquires his portion of the family fortune (he and his father had made amends) but finds himself in jail again for six months as he continues to foment agitation. Upon his release, Penn sees conditions for Quakers deteriorating even further as they are being persecuted at accelerating rates. Penn has an idea. Back in his childhood, in the late 1640’s, the English Civil War was raging and his father, the Admiral, had single-handedly fed the Commonwealth Navy and paid for it personally. While Admiral Penn was rewarded handsomely by Oliver Cromwell with the confiscated estates of seized Irish Catholics for his naval successes, the debt (£16000) had never been repaid. 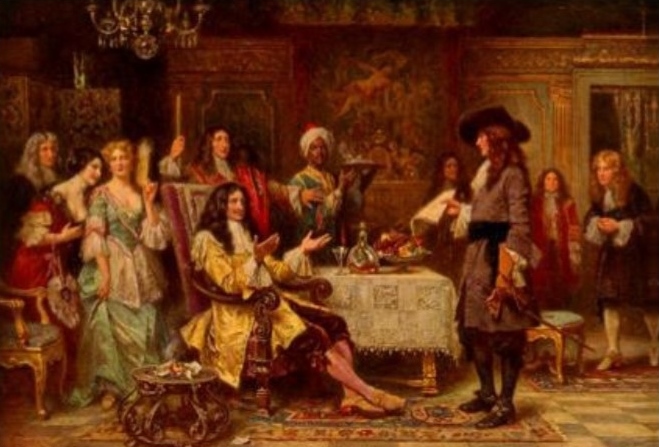 In May of 1680, William Penn hatched his plan: he petitioned King Charles II with this offer: he would forgive the Crown the debt to his late father’s estate in return for land in the New World. On this land he would establish a colony for Quakers and persecuted religious groups. Some Quakers had already moved to North America, but the New England Puritans, especially, were as hostile towards Quakers as Anglicans in England were, and some of the Quakers had been banished to the Caribbean. 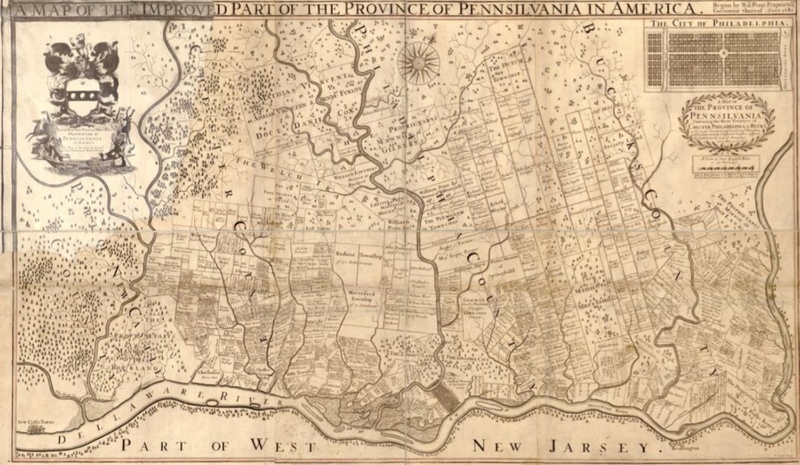 In 1677, a group of prominent Quakers that included Penn purchased the colonial province of West Jersey (half of the current state of New Jersey). That same year, two hundred settlers from the English towns of Chorleywood and Rickmansworth in Hertfordshire and other towns in nearby Buckinghamshire arrived, and founded the town of Burlington. George Fox himself had made a journey to America to verify the potential of further expansion of the early Quaker settlements. In 1682, East Jersey was also purchased by Quakers. King Charles II referred Penn’s request to the Lords of Trade and Plantations, a committee of his Privy Council responsible for managing the Crown’s colonial commerce. Whether from personal sympathy or political expediency, to Penn’s surprise, the King granted an extraordinarily generous charter which made Penn the world’s largest private (non-royal) landowner, with over 45,000 square miles. Penn became the sole proprietor of a huge tract of land west of New Jersey and north of Maryland, and gained sovereign rule of the territory with all rights and privileges (except the power to declare war). For several months the Lords of Trade and Plantations worked out the details, consulting periodically with Penn and appropriate crown officials such as Lord Baltimore, the proprietor of Maryland, and James, Duke of York, who administered the peninsula between the Delaware Bay and the Chesapeake Bay, also newly won from the Dutch. The land of Pennsylvania had belonged to the Duke of York, who acquiesced, but he retained New York and the area around New Castle and the Eastern portion of the aforementioned peninsula. In return, one-fifth of all gold and silver mined in the province (which had virtually none) was to be remitted to the King and the Crown was freed of a debt to the Admiral of £16,000, equal to £2,123,423 or $3,279,414 today. 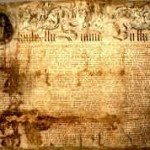 A draft of Penn’s Charter was presented to King Charles II on February 25, 1681. He approved it, insisting the new colony be named Pennsylvania to honor Penn’s father. The younger Penn had wanted to call it “New Wales” or simply “Sylvania,” a Latin word for forest, but the Crown prevailed. 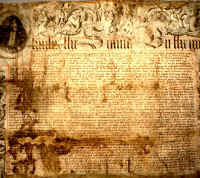 A final version was executed on parchment, as were most British charters, and the text written in engrossed, or oversized, calligraphy by royal clerks. On March 4, 1681, the King signed the charter and the following day Penn jubilantly wrote, “It is a clear and just thing, and my God who has given it me through many difficulties, will, I believe, bless and make it the seed of a nation. 2. Dobrée, Bonamy. William Penn: Quaker and Pioneer. Houghton Mifflin Co., New York, 1932. 3. Fantel, Hans. William Penn: Apostle of Dissent. William Morrow & Co., New York, 1974. 4. Kannegieter, J.Z. Geschiedenis van de vroegere quakergemeenschap te Amsterdam, Amsterdam/Haarlem, 1971. 5. Miller, Randall M. and Pencak, William, ed., Pennsylvania: A History of the Commonwealth. Penn State University Press, 2002. 6. Soderlund, Jean, ed. William Penn and the Founding of Pennsylvania, 1680-1684: A Documentary History. Philadelphia: University of Pennsylvania Press, 1983. 7. PA Historical and Museum Commission “This Venerable Document” by Ries, Linda and Stewart, Jane Smith.